This year at Canada’s National Ukrainian Festival at Dauphin, Manitoba 29-31 July 2016, one couldn’t help but notice the large modified tour bus near the entrance to the Grandstand stage. This curious, quiet, yet attention-grabbing state-of-the-art ‘mobile learning space’ turned out to be one of the most memorable experiences of the entire festival weekend. Sponsored by recognizable organizations, such as the Canada-Ukraine Foundation, the Ukrainian Canadian Congress and the Government of Canada, as well as the Temerty, Ihnatowycz and Jacyk Foundations, among others, the Holodomor Mobile Classroom (HMC) is a brilliant and very effective means of raising awareness about the tragedy of the Ukrainian Genocide. 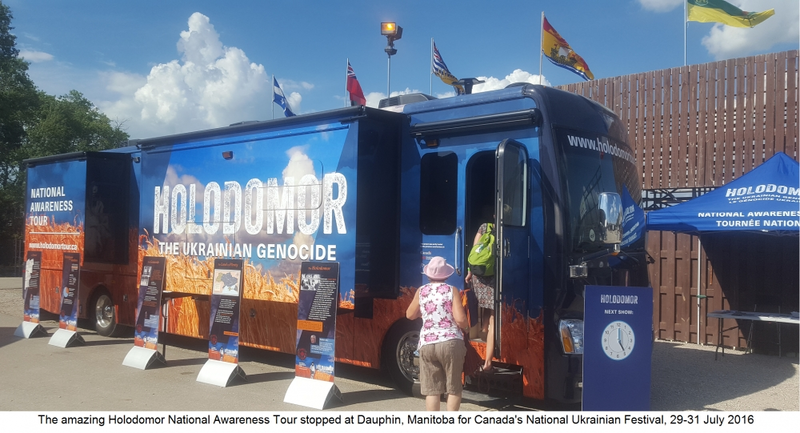 There is a whole education program associated with the Holodomor National Awareness Tour that is travelling to as many towns and cities as possible, crisscrossing all of Canada. Universities, schools, communities and organizations invite the “HMC” to visit them. Students and groups are engaged in discussions and, with the use of hands-on digital media, learn not only about the Holodomor, but they learn about society and human respect and dignity. What was offered to Dauphin Festival-goers was a shorter, but extremely professional audio-visual presentation on the truth and significance of the Holodomor. The Holodomor, of course is the famine genocide carried out by the Soviet regime led by joseph Stalin in 1932-33 resulting in the deaths of millions of Ukrainians. The National Awareness Tour has been to Winnipeg and other points in Manitoba. It is definitely worth the effort of going out to see what they show and it is worth inviting to your neighbourhood, school or special event. The video presentation is not ‘graphic’ by today’s standards but is very powerful and the message is very clear. One of the most powerful images are the faces of many (yet relatively very few) of the victims of the horrible deed of the famine. They are faces of people that you see in your church, around a shopping mall, at your school, your family members and relatives and you are struck by the thought why did they deserve this!? How could anyone order such a horrific program of extermination!? How could the local people have carried it out!? Is it happening in the world today!? Could it happen in our world!? What can I do! ?